The Butterfly Gardens are designed specifically for the hosting and breeding of tropical butterlflies and moths, and represents an interesting and educational visit. The gardens contain about 40 native species. You will see various stages of the butterfly life cycle, from live eggs, larvae, pupae and mating butterflies. Visits may be self-guided or you can have a volunteer guide. You can also learn about the breeding techniques used by the Garden. The atmosphere is kept artificially moist using a humidifier, enclosed under a large dome. The butterflies are of course flying free in their own mini tropical rainforest environment. In addition, there is a specific new insectarium containing an ever increasing number of insects. Needless to say, insects have been around for 400 million years and represent 80% of all the world's fauna, and play a major role in the ecology of nature. This provides another interesting aspect to the Butterfly Gardens. There is also a small aquarium containing corals and unusual fish species such as black-tip sharks and long-horned cowfish. And the garden itself has streams and ponds providing a home for a large collection of fish such as koi (carp) and rare shell-less turtles. The garden has a large orchid nursery, covering more than 1,600 sq. meters, with a number of exotic & rare varieties of orchids. And this Garden and Thai Village also offers an opportunity to experience some traditional Thai culture through classical dance, interspersed with Thai boxing, long-pole fighting, sword fighting exhibitions and elephant shows. Dances include Fon Tian (candlelight dance), Fon Leb (fingernail dance), Sukhothai dance, bamboo dance, tin-sifting dance, Norah and Ram Wong (folk dance). During the Ram Wong the audience is invited to join in with the dancers. The performers present examples of the culture of all parts of the Kingdom, but with an emphasis on the unique aspects of Phuket and life in the South of Thailand. The cultural show is twice daily at 11.00am and 5.30pm. There are also four restaurant pavilions, a playground for children of all ages, Thai handicraft shops, and workshops. The workshops give the visitor the chance to watch the artists and artisans of Phuket, and other regions of Thailand, as they create their special products. In addition to pottery making there is silver working and woodworking, umbrella painting, straw weaving and many handicrafts that are made with seashells particular to Phuket. The selection of Thai handicrafts are ideal for gifts, home & office decor. The venue also offers Traditional Thai Wedding ceremonies. You can choose a traditional Western wedding, a Brahmin ritual, a Thai procession or a combination of all of these. It is possible to make an official registration by an authorized officer who will legally record the marriage. The Buddhist element is also popular with a traditional ceremony that includes the formal blessings by the Buddhist monks. This is not a tourist attraction per se. It is a family business. Even though there are many nurseries offering orchids, this is Phuket's largest orchid nursery with 1500 different hybrids and species and was established in 1975. Extremely interesting orchid garden tours are provided for just 100 baht/person, which includes a complementary Orchid bouquet. Orchid flowers, orchid plants and flask gardens are for sale. Flask gardens contain hybrids as well as species. Wholesale and retail pricing is available. Cut flowers are packed and ready for international air travel - these are delivered to your hotel one day before your departure. Orchid Jewelry is also available - all handmade from real orchid flowers dipped in 24 karat gold. 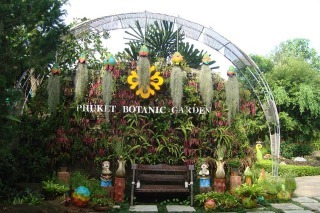 Phuket Botanic Garden is open for visitors as a recreational attraction as well as a research centre which includes some rare plant species. It has various collections of tropical and exotic plants set out over a zoning layout. 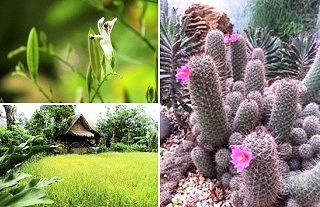 Each zone contains different species such as herb garden, tropical palms, fragrant plants, fruit orchards, orchids pavilion etc. Phuket Zoo is a relatively small homely zoo, set in 65 rai of lush tropical gardens, located at the northern end of Chalong Bay. It is a perfect relaxing, charming environment for the family, with hours of viewings and entertainment. There are tigers, elephants, monkeys, crocodiles, camels, a bird park, a small exotic aquarium, and orchid garden. Amazing elephant shows 10.30 am. 1.30 pm. 4.00 pm. Crocodile wrestling 9.45 am. 12.45 pm. 3.15 pm. 5.30 pm. Lovely monkey shows 9.00 am. 12.00 am. 2.30 pm. 4.45 pm. At the Phuket Aquarium there are probably one hundred species of aquatic life on display, many of them from the waters around Phuket. It was re-opened to the public in April 2005, after a two and a half year extensive renovation project. One of the highlights of the new aquarium is a 10 metre long underwater glass tunnel. The Phuket Aquarium & Marine Biological Research Centre is Thailand's major marine biological research station, and conducts research on tropical reef ecosystems, commercial fisheries, and other projects. The centre also hatches and breeds species of endangered sea turtles in order to release them back into the sea. The Aquarium is well laid out, with labels in English and Thai. In the main hall, the display is divided into two sections - marine creatures, and fresh water plants & fish. The marine life display consists of some 22 tanks. An underwater glass tunnel exhibits some of the diverse marine life from the Andaman Sea (such as banner fish, butterfly fish, Napoleon wrasse, grouper, snapper, and bluefin trevally). There are over fifty species of fresh water plants and fish (eg amazon cobia, electric eel) on display in the second section. There is also a "Touch pool", which is inhabited by shallow reef creatures such as sea stars and sea cucumbers. Visitors may gently touch these cretaures. Getting there: Phuket aquarium is located at the extreme south eastern tip of the island at Ao Makham on Cape Panwa. A Songtaew (local bus) can be taken from the Talad Soht, or Fresh Market in Phuket town. Chana Charoen Crocodile Farm is probably the most well known farm. There is an interesting aquarium with some 1,000 aquatic species, especially freshwater and estuarine crocodiles and alligators. The setting is an open tropical garden-zoo atmosphere, and there are also some snakes, birds, and an elephant show. There is also the crocodile show at Phuket Zoo, as already referenced on this page. Elephants are the very symbol of Thailand. The Thai elephant has been an integral part of Thai culture for centuries. The elephant is regarded as the symbol of prosperity and power, and grace, befitting that of a monarch. Revered by ancient kings, the majestic Thai elephant held a respected place in Thai history and is prominently featured in Thai legend, literature, Buddhist folklore, art and architecture. The Thai elephant belongs to the mainland subspecies of the Asian elephant, Elephas maximus. It is a graceful creature of great intelligence, known for its unwavering loyalty, and a remarkable ability to learn. It is capable of forging friendships and life long bonds with its mahout - the individual who cares for it. In daily life, mahout and elephant depend on each other and the elephant is treated as part of the 'family'. From the beginning of Thai history, elephants have nobly and faithfully served both kings and commoners in war and in commerce. Sadly the majestic wild Asian elephants, that roam the forests of Thailand, have dwindled in numbers. It is notable that at the start of the 20th century over 100,000 elephants graced the Thai countryside. Today only 3,000 - 4,000 Asian Elephants are left in Thailand. Around half of this number are domesticated, the remainder living wild in National Parks Reserves. Tourism provides one of the few legal ways for captive elephants and their owners or mahouts (handlers) to earn a living in Thailand today. Due to a ban on logging ten years ago, the elephants lost their traditional source of support. A good proportion of Thailand's captive elephants are in full or part time use in the tourism industry. Nearly two hundred elephants are currently working on Phuket providing visitors with safari trips into the jungle and along the waterways. Almost this entire population of Asian elephants have been trucked to South Thailand from the country's northeastern region. It probably comes as no surprise to learn that an average adult Asian elephant, weighing between three to five tons, consumes a lot of food and drink on a daily basis - 250 kg of vegetation and 200 litres of water. Since Phuket has only limited resources, much of the food has to be brought in from neighboring provinces. All elephants have a personal mahout or trainer who cares for their daily needs. There are at least twenty five elephant trekking camps and locations on Phuket, and your hotel will no doubt offer suggestions and recommendations. One of the original, largest and most well known trekking tour companies is the Siam Safari Nature Tours which has over 16 years experience of operating nature tours in Southern Thailand. They offer elephant trekking, jungle trekking and more. 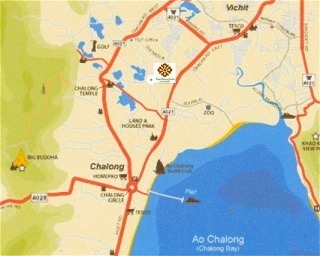 They are based in Chalong and their elephant camp is in the Chalong highlands midway between the east and west coasts. They also offer elephant trekking further afield in Khao Sok National Park on the mainland. 45 Chao Fah Road, Chalong, Phuket 83130. Future plans of the Foundation include setting up an elephant sanctuary in the region to care for old, blind, sick or injured elephants which will include a burial ground. In conjunction with the Foundation, Siam Safari have set up a Mobile Elephant Clinic to facilitate veterinarian visits to any sick animals. Most of Phuket's international resorts have a donation box for the Elephant Help project. A visitor to Phuket can make an important contribution to the well being of the elephants with a monetary gift. Also enjoy the 950 sq metre Garden Maze - every day a new way. A-Maze-in-Phuket is a garden hedge maze and is the only one of its kind in Phuket. There is also a coffee shop and a souvenir shop. This venue offers private evening functions on request. Thailand is the habitat for several varieties of venomous snakes as well as many harmless species. The poisonous snakes that are indigenous to Thailand are cobra, king cobra, banded krait, Russell's viper, some pit vipers and many of the thirty species of sea snakes. Many snake farms extract venom from the snakes in order to study and develop anti-venom serum to treat snake bite victims. The normal procedure for extracting the venom is through the use of a glass receptacle with a membrane cover. The snake handler holds the snake just behind the head and places the glass receptacle for the snake to bite into the membrane. The venom flows into the glass receptacle. The venom is then used to make the vaccines. Sometimes snakes are also bred at the farms. Typically shows at the farms are partly educational with demonstrations on what to do if you encounter a snake in the wild or get bitten by one. The rest of the show involves snake handlers charming and performing stunts with poisonous snakes (pit vipers and especially cobras) and the handler will no doubt kiss a king cobra on its head. The audience may get a chance to handle a (lazy, non-poisonous) python. The production and preparation of cashew nuts is one of Phuket's lesser known local industries. Although the nuts are often an expensive treat in many parts of the world, in Phuket cashews can be purshased fairly inexpensively in their natural raw state, or prepared with a variety of spices or flavours. The Cashew Tree is quite a useful tree, and every part (roots, bark, leaves, fruit, oils and of course the nut) has it's uses (including medicines, drinks, and even industrial purposes such as a component for auto brake linings). In addition to the nut, the juice (cashewy drink), made from the cashew apple, is becoming quite popular, and is reported to have medicinal benefits. The Cashew juice is sold in concentrated form, and contains all natural flavours and colours with no preservatives. You will no doubt be invited to taste upto a hundred varieties of cashew nuts, and you will be given information on growing, harvesting and preparing this delicious nut. Visits to these cashew locations are certainly very interesting, and of course local cashew produce are available for sale there. Phuket is Thailand's main region for cultured pearls. Some of the more luxurious Southsea species of pearl cultivated here measure more than one centimeter in diameter. They take up to five years to grow and are typically priced at 230,000 baht for a pair. Necklaces of grey-black pearls cost five times as much. There are several pearl farm companies, and at least two allow visits to the actual farms. One such farm is Phuket Pearl Farm Co. which has been in operation for twenty five years, and their demonstration farm is located on Rang Yai Island just a few minutes from Boat Lagoon Marina, off the east of Phuket. It produces top quality pearls for export around the world. There is a live demonstration of how pearls are cultured, harvested and turned into beautiful pieces of jewelry. Please refer to our Island section for location details. They have a larger farm on the more remote Nakha Yai island. Although almost all pearl farms are situated off the sheltered eastern coast, the industry did suffer some damage from the December 2004 tsunami and many oysters were washed away. The management of the Upside Down House also operate The FootZone. This is a modern and innovative concept for a refreshing reflexology massage. Located at Biztown on the Bypass road next to IKEA. Open daily from 10.00am to 6.00pm with prices from 300 baht. The management of the Upside Down House in addition also operate 30MinToEscape at Jung Ceylon, Patong. This is a new real escape game concept. It is a fun and challenging experience for families, for friends and for team building. There ae currently two themes - robbers in trouble - and - the lost temple. Players are locked inside a room and must try to find a way out in a limited time. Located on the 3rd floor at Jung Ceylon shopping mall, Patong. There are a few bird nest soup restaurants in Phuket. Edible bird's nests are among the most expensive animal products consumed by humans. The nests have been used in Chinese cooking for over 400 years, most often as bird nest soup. The most famous use of edible birds nest is bird nest soup, a delicacy in Chinese cuisine. When dissolved in water, the birds' nests have a gelatinous texture used for soup or sweet tong sui. It is mostly referred to as "yan wo" unless references are made to the salty or sweet soup in Chinese cuisine. In addition to its use in soup, edible birds nest can be used as an ingredient in many other dishes; it can be cooked with rice to produce bird's nest congee or bird's nest boiled rice, or it can be added to egg tarts and other desserts. A bird's nest jelly can be made by placing the bird's nest in a ceramic container with minimal water and sugar (or salt) and double steamed. Ready to eat bird's nest jelly is available in jars as a commercial product. The most heavily harvested nests are from the Edible-nest Swiftlet or White-nest Swiftlet (Aerodramus fuciphagus), and the Black-nest Swiftlet (Aerodramus maximus). The white nests and the red nests are supposedly rich in nutrients, which are traditionally believed to provide health benefits, such as aiding digestion, raising libido, improving the voice, alleviating asthma, improving focus, and an overall benefit to the immune system. Most nests are built during the breeding season by the male swiftlet over a period of 35 days. They take the shape of a shallow cup stuck to the cave wall. The nests are composed of interwoven strands of salivary laminae cement. Nests have high levels of calcium, iron, potassium, and magnesium. A kilogram of white nest can cost up to $2,000 USD, and a kilogram of red nests can cost up to $10,000 USD. The white nests are commonly treated with a red pigment, but methods have been developed to determine an adulterated nest. Natural red cave nests are often only found in limestone caves in a bird nest concession island in Thailand. There is also a cheaper black variety containing foreign matter. The nests were formerly harvested from limestone caves. With the escalation in demand these sources have been supplanted since the late 1990s by purpose-built nesting houses, usually reinforced concrete structures. These nesting houses are normally found in urban areas near the sea, since the birds have a propensity to flock in such places. In Phuket and Phang Nga Thailand, as in other nest producing countries (Malaysia, Indonesia, and the Philippines), the government exercises strict control over collection to ensure the bird's survival. Bird's nest companies in Phuket have exclusive collecting rights and pay the government an annual fee for the privilege. Bird's nest collecting is a lucrative business and is tightly controlled. The collectors have an exclusive government concession to collect nests in the Marine Parks. The nest collection concession, which is auctioned every 5 years, costs about 100,000,000 THB. The nests are so precious that they are protected by guards during the collection season, in order to deter robbers who might steal them. The guards also protect the birds from natural predators such as snakes, cockroaches and eagles. Rock climbers who wish to climb off the beaten track are advised to be careful. The bird's nest collectors control large numbers of perfect climbing islands in Phang Nga bay and off the southwestern Thai coastline. Climbers who climb such crags without permission will find themselves in deep trouble. The nests themselves are tiny translucent cups about the size of a small egg. They are made by the male swiftlet from glutinous threads of its own saliva, which it weaves into a cup that dries to become thin and translucent like fine porcelain. Chinese parents feed bird nest soup, cooked with chicken broth or coconut milk, to their children in the belief that it will improve their complexions, promote growth and generally act as a tonic. Recent research has indeed shown that the nests, which taste rather like noodles, contain a water-soluble glycoprotein that may promote cell division in the immune system. Black nests sell for an average of 10,000 THB per kilo, whilst perfect white nests can fetch as much as 50,000 THB per kilo. The nest of the swiftlet Collocalia Fuciphaga is highly prized by the Chinese as a powerful pick-me-up tonic and is typically ingested at the banquets of the rich in the form of bird nest soup. A good quality bird nest soup is always expensive (eg 500 to 1,000 THB per small bowl). If you find one with lower price it may not be the real quality one. During the collecting season, from February to May, the collectors work without food from sunrise until sunset, when the caves fill with flocks of bats and roosting swiftlets. Sometimes nest gatherers have to swim underwater to reach a submerged cavern or to squeeze through tiny blowhole passages to reach a cave's ceiling. The caves themselves are often spectacular cathedrals of stalagmites and stalactites, covered in thick carpets of guano and seething with hordes of golden cockroaches. Nest collecting is skilled and dangerous work, high up on the ceilings of the caves which abound on the Thai coast and its offshore islands. The intrepid collector shins barefoot up rickety trellises of bamboo scaffolding, ropes and bridges, tapping as he goes to make sure the bamboo is sound. He lights his way in the black caves with a torch of bark soaked in resin held between his teeth and uses a special three-pronged tool called a rada to harvest the nests. To use bare hands to pick a nest displeases and angers the gods. A sustainable supply of birds' nests is ensured and the survival of the species is protected because nests are collected only when empty. The most productive island for nests is Ko Petra, from which over 100 kg of nests are collected 3 times in a good year. Ko Lao Liang supplies about 30 kg of nests 3 times a year. After the chicks have flown away the mother will eat the nest in order to replenish her energy supply. The collectors must find the nest before the mother eats it. The rubber tree, Hevea brasiliensis Muell. Arg is indigenous to the Amazon basin. During the nineteenth century, Brazil was the main supplier of hevea latex, which was collected through tapping of trees in the natural forest. Rubber seedlings smuggled out of Brazil became the parent planting stock for all rubber plantations developed in Southeast Asian countries at the turn of the twentieth century. The most important rubber producers today are in Southeast Asia (Thailand, Malaysia, Indonesia). Today Brazil plays an insignificant role in international markets. 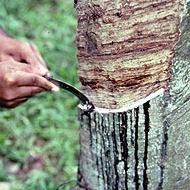 Tapping of rubber trees starts in the fifth to seventh year after planting and then continues for 25 to 30 years. A special knife is used to incise the bark so as to wound the resin canals without damaging the cambium. 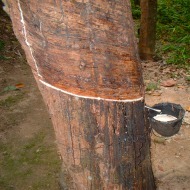 After 30 years, the tree suffers a decline in latex production - thus making further tapping of the trees uneconomic. The old trees are then removed and replaced with new seedlings. A 30-year old cultivated rubber tree is about 30 m tall with an average branch-free bole of 3 m. The diameter at breast height (dbh) may reach about 30 cm. The stem tends to taper. Young rubber trees have a smooth brown-green bark. At a typical rubber tapping demonstration, one can observe an expert use a special sickle to slice the bark of the rubber tree and let its milky sap trickle into a container. You can also consider asking for a crash course and have a try for yourself. One such demonstration facility is between Kata village and Kata View Point. Phuket's renowned transvestite cabaret show has established itself as a leading entertainment venue and is indeed very popular. It features an exotic, spectacular, often risque, musical floor show. There are stunning extravagant costumes, expensive sets, an excellent hi-tech sound and light system, and of course incredibly glamorous performers. The venue is exclusive, luxurious and intimate with 600 seats. This is a very professional and entertaining show (twice daily at 19:30 and 21.30 hrs). This is a stunning 140-acre unique cultural theme park entertainment complex built at a cost of 3,500 million baht, and promises to be the ultimate in nighttime entertainment on Phuket. Phuket Fantasea was inspired by Thailand's rich and exotic heritage, and it not only showcases the charm and beauty of Thailand, but also enriches ancient Thai traditions with the wonders of cutting edge technology and special effects. There is a breath-taking Las Vegas-style theatrical show, where state-of-the-art technology and special effects enhance the beauty of Thailand's Myths, Mysteries and Magic in an amazing extravaganza ('Fantasy of a Kingdom'). At the heart of Phuket Fantasea is the magnificent Palace of the Elephants, a state-of-the-art theatre with wonderful acoustics and seating 3,000 persons. Fronted by a glorious reconstruction of a Sukhothai-era stone palace, with intriguing elephant statues, the theatre puts on a spellbinding show combining culture and illusion. The spectacle blends the beauty of Thai culture with magical illusions, 4D effects, acrobatics, aerial ballet, pyrotechnics, special effects, exciting stunts and elephant performnaces featuring over thirty elephants. The Festival Village is a wonderful introduction to the theme park, where the accent is on fun and entertainment coupled with Thailand's legendary hospitality. Each fascinating facade promises a unique shopping experience, where visitors can buy high quality locally made products such as silk, leather, handicrafts, ceramic, jewelry, souvenirs, unusual items and much more. Also enjoy the cultural parades, pageants, craft demonstrations, street shows, live bands, elephant rides, and games. The Golden Kinnaree grand buffet restaurant offers a sumptuous feast of Royal Thai dishes and international delicacies prepared by some of Thailand's finest chefs. Splash Jungle water park is at West Sands residential development at Mai Khao beach just north of the airport. West Sands is a residential and hotel/resort development (reportedly owned by Sir Terry Leahy, boss of international supermarket chain Tesco). Splash Jungle is owned and operated by West Sands Residences and Resort, which is a Property Development Trademark of the Central & City Developments Limited Group. The Splash Jungle is open to the public but there is an entry charge. This nighttime attraction covers about 1,000 sq meters in front of the Sipa building at Saphan Hin, Phuket town. There are 100 water nozzles, and the pressure at each nozzle, along with the sound and lighting are all computer controlled. There will be a different theme for the water show each month - for example, Loy Kratong in November, and New Years Eve at the end of the year. The inaugural water show in September 2011 had, naturally, a Vegetarian Festival theme. 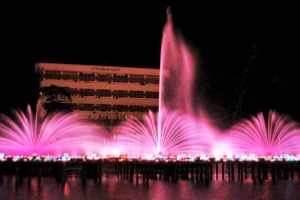 The only other musical fountain is at Jung Ceylon in Patong. The Aphrodite cabaret show, is situated at the former Phuket Brewery location on the bypass road opposite Tesco-Lotus in Phuket town. There is a cabaret theatre and the sukiyaki restaurant. The venue can seat 900 people at a time. The cabaret performers include eighty katoeys from Bangkok and Phuket.